In 12-inch skillet, heat 1 tablespoon of the oil over medium-high heat. Add leeks; cook 3 to 5 minutes, stirring frequently, until tender. Remove leeks from skillet; set aside. Sprinkle both sides of pork chops with salt and pepper. In same skillet, heat remaining 1 tablespoon oil over medium-high heat. Add pork; cook 5 to 6 minutes, turning once, until golden brown on each side. Spoon leeks over pork. Pour beer around pork. Heat to boiling; reduce heat to low. Cover; simmer 45 to 50 minutes or until pork is tender. Remove pork from skillet; cover to keep warm. In small bowl, stir together flour and 1/4 cup hot juices from skillet. Pour mixture into skillet; cook over medium heat 5 to 6 minutes, stirring constantly with whisk, until gravy is thickened and bubbly. 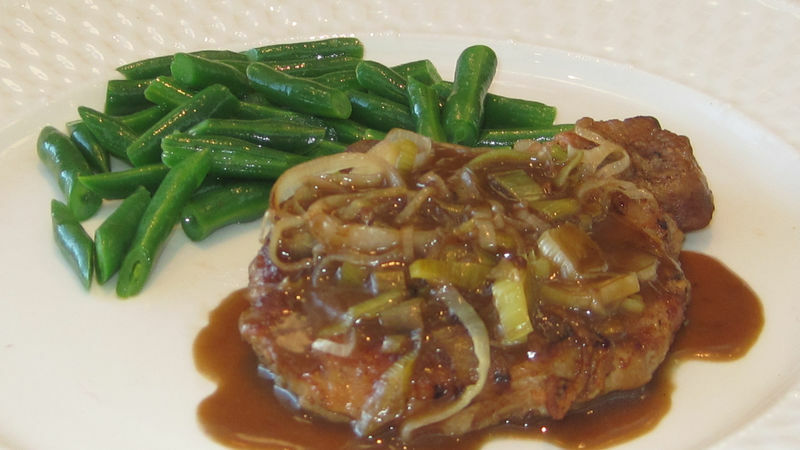 Serve gravy over pork chops. Leeks are usually about 12 inches long and 1 to 2 inches in diameter. They look like a large green onion but are milder in flavor than onions. Before slicing, cut the leek in half and rinse well to remove any grit that may be trapped between the layers. Stout is a dark beer made using roasted malt or barley, hops, water and yeast. Stouts were traditionally the generic term for the strongest or stoutest porters produced by a brewery. Irish stout is very dark and often has a toast- or coffee-like taste. The most famous is Guinness, followed by Murphy’s and Beamish.